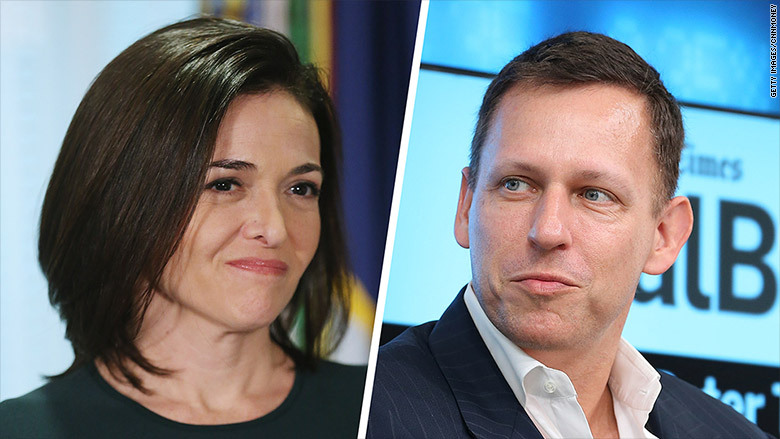 Peter Thiel's seat on Facebook's board is not in jeopardy, despite the tech entrepreneur's secret legal campaign against Gawker Media, Sheryl Sandberg said Wednesday. At Recode's Code Conference, Facebook's chief operating officer said "I understand the concern" about Thiel, but "Peter did what he did on his own." She suggested that it has no bearing on his role on Facebook's board. Some media critics disagree -- they see Thiel's bankrolling of lawsuits against Gawker as a disturbing threat against the news business and cultural norms. Thiel's support for Hulk Hogan's lawsuit against Gawker was revealed last week. Since then, several prominent commentators have questioned whether Thiel should lose his longtime Facebook board seat. But Sandberg said that's not happening. Speaking onstage with Kara Swisher, she said "these are hard issues," but she emphasized that Facebook executives were not aware that he had financed the litigation and that "he didn't use any Facebook resources" to do it. Gawker, she added, gets the same distribution from Facebook as other publishers. Gawker is also one of Facebook's initial partners for Facebook Live video streaming; the media company is paid to produce a certain number of live streams. Audience member Josh Topolsky, a tech journalist who cofounded The Verge, pointed out that Thiel could be secretly funding other lawsuits against other media companies, and asked if that would compel Facebook to sever ties. Sandberg said, "It's really hard to answer all of these hypotheticals. But what really matters is that we're an open platform." Thiel was invited to speak at Code this week but has not agreed to attend. Gawker Media founder Nick Denton will speak at the conference on Thursday. Sandberg was also quizzed about the recent controversy involving Facebook's "Trending" topics section. She said the company sought to take conservatives' concerns seriously, and "we want the continuing dialogue." Sandberg, a Disney board member, has been mentioned as a contender for the CEO job at the media company when Disney CEO Bob Iger's contract expires in 2018. Asked by Swisher, she said she loves her job at Facebook and "I don't want another job."